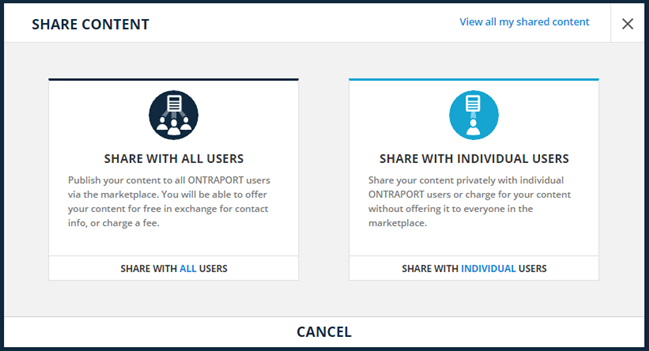 The ONTRAPORT Marketplace allows users of ONTRAPORT to share Campaigns, ONTRApages, ONTRAmail and ONTRAform templates among the ONTRAPORT community. As an ONTRAPORT client, you have access to any user-created templates available in the ONTRAPORT Marketplace and can contribute your own for use by others. There are three options when it comes to sharing your designs in the ONTRAPORT Marketplace: "for free" using one of several different methods: free to all ONTRAPORT clients, free to specific ONTRAPORT clients, or free to any ONTRAPORT client with a link. You can also charge for your designs or content with a one-time payment or a recurring subscription payment. ONTRAPORT handles the billing details and forwards 90% of the purchase or subscription price to you. To learn about sharing Campaigns in the Marketplace, please see this article. In Pages click New Landing Page and select the ONTRApages icon. Featured: Featured templates that include shared templates. My Shared Templates: Templates you have shared. Shared With Me: Templates that have been shared with you. Purchased: Templates that you have purchased. Free: Templates being shared at no cost. Recently Used and Favorites are templates selected by either your use of them or you indicating they are a favorite template. Use the same process to view shared templates in ONTRAmail by navigating to Contacts > Messages in step 1 above. After viewing the template, you can choose to use it. For paid templates, ONTRAPORT will prompt and confirm you want to pay for the template. Your credit card information is processed by ONTRAPORT and not provided to the template provider. 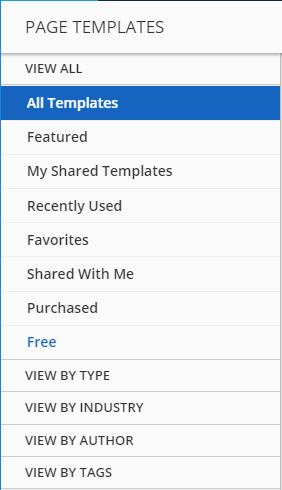 There are several ways you can share your templates in the Marketplace. You can choose to have it listed for all ONTRAPORT clients for free, or have them pay to use the template. ONTRAPORT takes care of the billing, and sends you 90% of the sales price when the transaction is completed. This method provides the widest audience for your template. You can restrict the sharing to specific ONTRAPORT clients by providing them with a link, or by entering their email address into the sharing settings. These two methods can provide the templates for free to a limited group. You can also have a purchase in your ONTRAPORT account trigger the sharing of the template. This method allows you to market your template independently to your Contacts who are also ONTRAPORT clients. If you add more templates using the same criteria the additional templates will be available to your customers. After you create and save an ONTRApage or ONTRAmail, you can click the Share this template button to select the options for sharing. 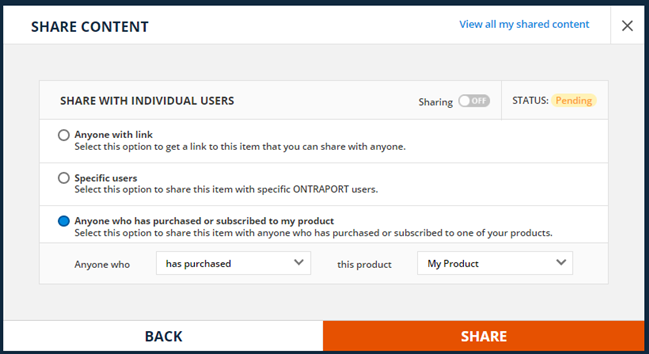 Choose to share your template with all ONTRAPORT clients by clicking the Share with all users button or with individual ONTRAPORT clients by clicking Share with individual users button. You do not need to share templates with your own users who log into your account. They have access to all of your templates based on their User Role and the permissions you have given them. Free: Content will be free for all users. Paid: Sell your template and earn 90% of the fee. Click the Share button to submit the template for approval by ONTRAPORT. Approval will take a few business days. You can check on the progress by visiting Administration > Marketplace Content Manager. Anyone with link: This option provides a link any ONTRAPORT client can use to access the template. Specific users: Select this option to enter email addresses of the ONTRAPORT clients you want to share your template with. Anyone who has purchased or subscribed to my product: Select "has purchased" or "is subscribed to" and then the product name in the drop downs to enable sharing to your customers. Note that "has purchased" provides access to the template as long as they are an ONTRAPORT client, and "is subscribed to" limits the use of the template to the subscription term. After the end of the subscription term the template will no longer appear in their Marketplace. Pages or emails they have created using your template, and saved under a different name, will remain available to them. Q. Can I create a recurring subscription and drip templates or content to my subscribers each week? A. You can do this two ways. 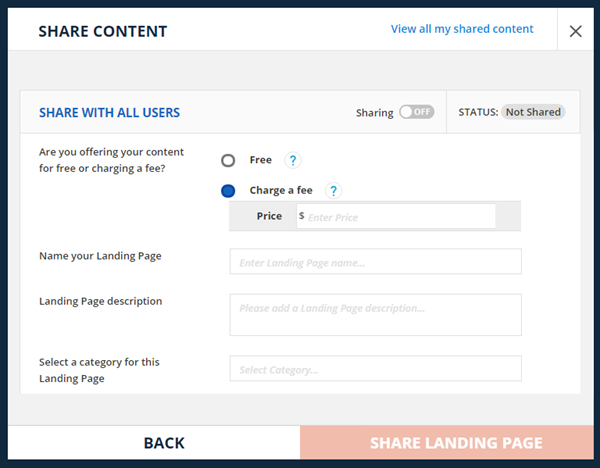 You can have the subscription product listed in the Share With Individual Users dialog and manually share the templates when you want to make them available. All your customers would get the templates as you share them. If you want an ONTRAPORT-style drip sequence using a Step Sequence, use the "Anyone with link" option instead. Have your subscription product add your customers to a Step Sequence. In the Step Sequence, have email steps that send the link for that week's content to the customer. This method will allow you to create all the content you are sharing, and have an Step Sequence provide the content with each email. Q. Can I sell my ONTRApages to non-ONTRAPORT customers? A. No. In order for your customer to see the template and content they will need an ONTRAPORT account. Q. Can I sell my LeadPages / ClickFunnels pages in the Marketplace? A. No, only ONTRAPORT templates will be available in the Marketplace. Q. Can I charge both a flat fee or a subscription for a single Marketplace item? A. No, but you can submit two templates, one for a flat fee price and one for a subscription price.